Mt. Everest is in the news again for tragic reasons. Three people have died, in as many days, on the 29,035-foot peak, reportedly of altitude sickness. Rescue efforts are ongoing for two other missing climbers. More than 400 people have tried to climb Everest this season, including 288 foreigners and more than 100 Sherpas and guides, said Sudarshan Dhakal, director of the Nepal Tourism Department. That’s more than the average for previous seasons, he said. The mountain represents the ultimate test of man vs. nature and many books have been written about it – including those about Sir Edmund Hillary and Tenzing Norgay who were the first climbers to reach the summit in 1953. In 1996 Beck Weathers and a climbing team pushed toward the summit of Mount Everest. Then a storm exploded on the mountain, ripping the team to shreds, forcing brave men to scratch and crawl for their lives. Tie-in to “Everest”, starring Josh Brolin, Jake Gyllenhaal, Keira Knightley, and Robin Wright. 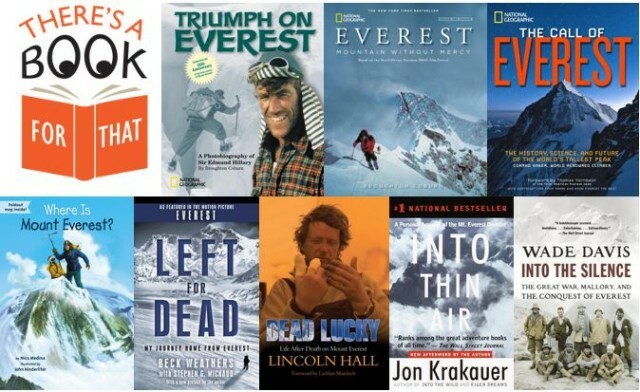 Gripping and sumptuous, this is the definitive book on the history, mystique, and science of Mount Everest, including how climate change is impacting the world’s tallest mountain. The definitive story of the British adventurers who survived the trenches of World War I and went on to risk their lives climbing Mount Everest. The terror and triumph of the May 1996 climbing season on Mount Everest will go down in infamy. Made famous by Jon Krakauer’s bestseller INTO THIN AIR and recounted in David Breashears’s gripping IMAX film, the story is relayed in National Geographic’s gripping volume, updated with brilliant new panoramic photography. A bank of clouds was assembling on the not-so-distant horizon, but journalist-mountaineer Jon Krakauer, standing on the summit of Mt. Everest, saw nothing that “suggested that a murderous storm was bearing down.” He was wrong. In this compelling narrative, Nico Medina guides readers through the mountain’s ancient beginnings, first human settlers, historic climbs, and the modern commercialization of mountain-climbing. This exciting photobiography celebrates the extraordinary life of the New Zealand farm boy who in May 1953 became the first person known to have reached the summit of Mount Everest. With climbing partner Tenzing Norgay, the iron-willed Hillary crossed deadly icefalls, clawed his way up vertical walls, and persevered through gale-force winds until he finally stood at the top of the world.